A good dust control strategy is essential to being a professional contractor and keeping your customer happy throughout a construction project. 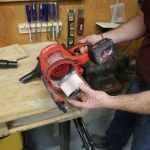 I’ve learned early on that capturing and controlling remodeling dust by keeping it out of the air and the non-remodeled area of your client’s home is often more important than the quality of your work. 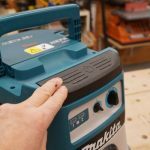 No one enjoys having to clean the job site after a sanding, cutting or drilling application that creates airborne dust that spreads EVERYWHERE! Dust inhalation can cause occupational asthma, silicosis, cancer and other debilitating respiratory diseases. Silica has been called the “New Asbestos”, and the U.S. Department of Labor and OSHA have issued rulings on reducing the permissible exposure limits for workers in our industry. OSHA has a Table 1 standard that identifies 18 common construction tasks that generate high exposures to respirable crystalline silica and for each task, specifies engineering controls, work practices and respiratory protection that effectively protect workers. 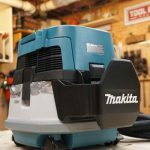 This new Makita 2.1 gallon vacuum meets OSHA Table 1 requirements based on its 99.97% filter efficiency, filter-cleaning mechanism and CFM rating. 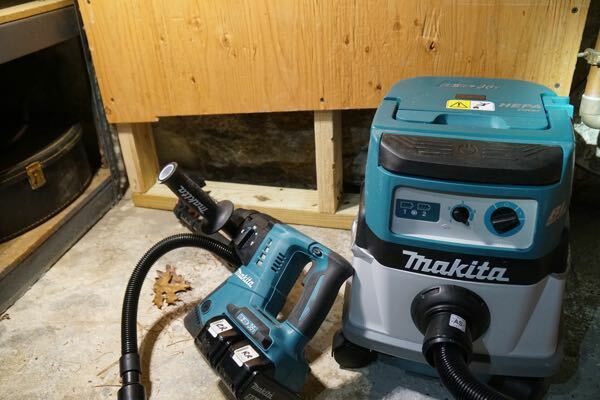 The Makita XCV04Z Vacuum has a powerful 9.2 amp motor, when equipped with two 18V LXT Lithium-Ion batteries it delivers 74 CFM and 36 in. water lift of suction using CORDLESS power. 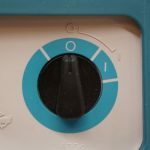 A suction control dial allows you to dial in for a variety of applications, although we left this in the highest setting for all our testing and use. 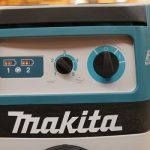 NOTE – if your looking for more suction, or are performing surfacing you will want to look at the corded version AC/DC] which boasts 127 CFM and 96 inches water lift of suction. 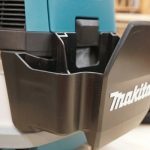 When powered by two 18V LXT Lithium-Ion 5.0 Ah batteries the Maikta vacuum will operate for approximately 65 minutes of continuous run time on low setting, and 30 minutes on high setting. 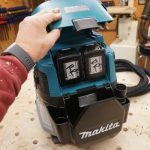 The MAKITA vacuum saw runs off of two 18 volt batteries, and draws power from both of them at the same time. It will NOT operate on one battery. Dual L.E.D. battery indicators show charge level for each 18V battery. We used this vacuum to collect concrete dust while drilling several 3/8” holes and during a chipping application. As far as the two batteries go, I’m starting to come around to them. 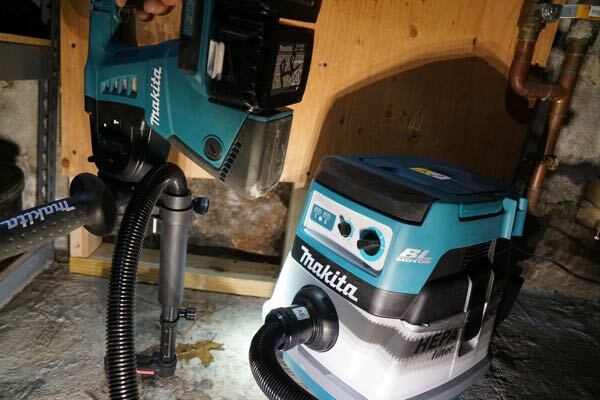 MAKITA feels strongly that staying in the 18-volt platform is the right choice for their end-users. They feel that if they can accomplish their task with one battery they will. 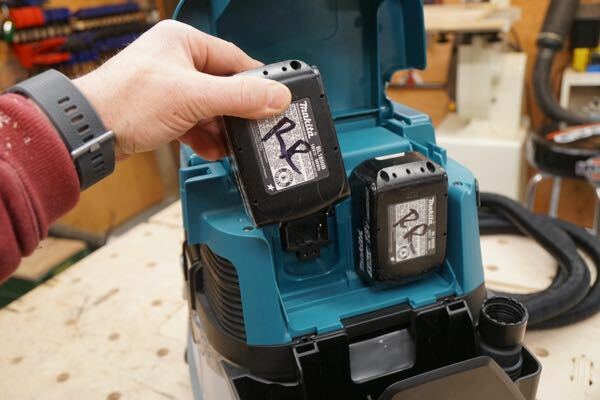 When the task requires high-power, more speed and or more run-time, then they design their tool with two batteries. 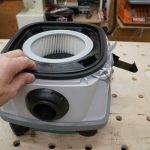 This vacuum features an efficient three stage HEPA filtration system captures 99.97% of particulates .3 microns and larger. 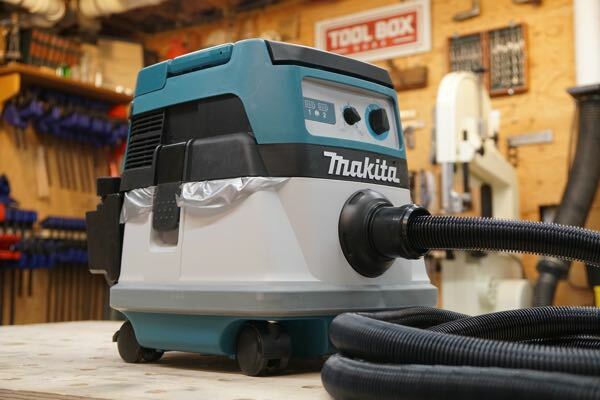 Makita designed a filter cleaning system to meet the new OSHA Silica rule. 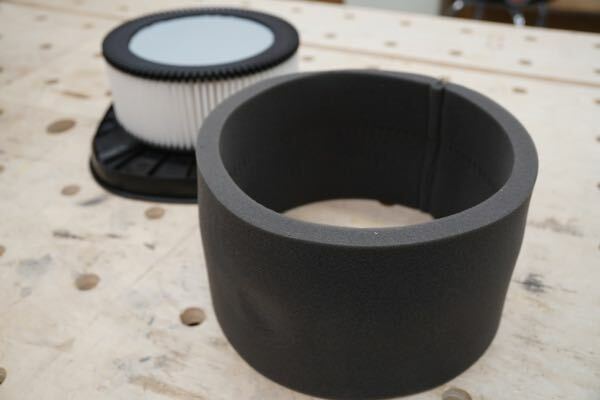 The filter cleaning system maintains optimum suction efficiency and longer filter life. 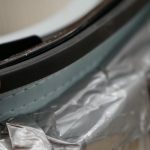 It’s not until you actually open this unit and change out the plastic bag that you can appreciate three stage filtration. 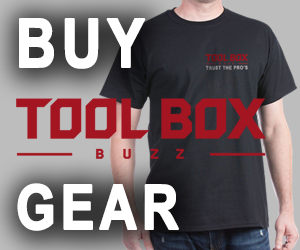 Everything fits snug, has rubber seals and is made with quality materials. 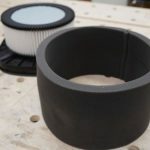 The filter cleaning system works this way. 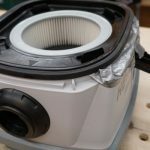 When the dust collector is operating (on mode), a damper compresses around the main HEPA filter. 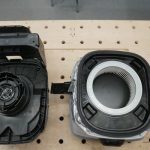 When the dust extractor is turned off, this damper rapidly expands back to its normal shape, cleaning [shaking] the debris off the pre-filter maintaining filter efficiency required for efficient suction performance. 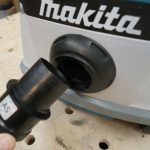 The Makita vacuums motor chamber is constructed of quality sound-absorbing materials for quieter operating sound levels. It is rated at 64 dB(A) and is reasonably quiet. 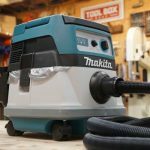 The Makita vacuum is equipped with a overload and over heat protection. 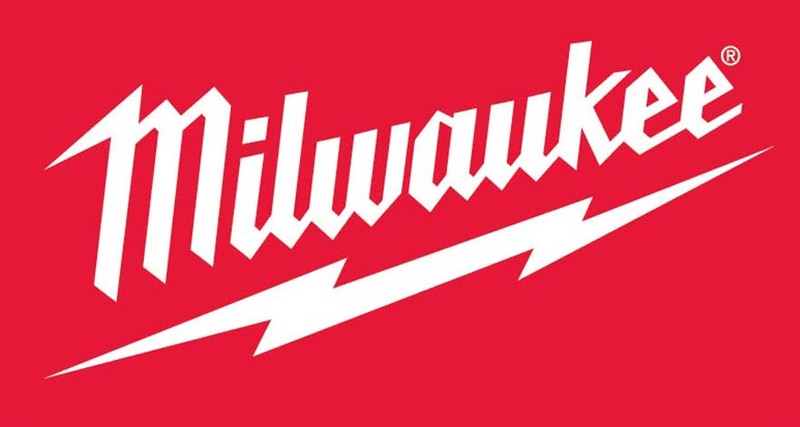 If the tool is operated in a manner that causes it to draw an abnormally high current, the tool automatically stops. 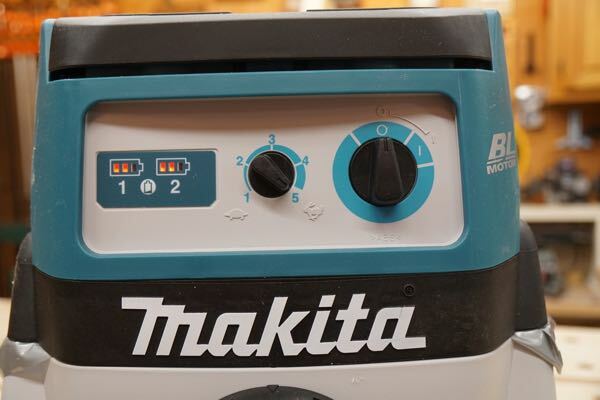 If the tool is overheated you will notice that the battery indicator will blink for 60-seconds. 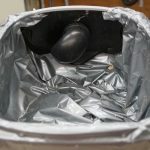 We brought this vac, along with a cordless SDS hammer drill to our job site to prep some concrete walls and to chip some irregularities left behind from enlarging, cutting out, a concrete wall. 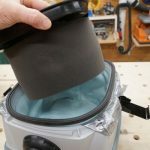 The vacuum is a no-nonsense tool, there is not a lot of bells and whistles to learn, and we like that. 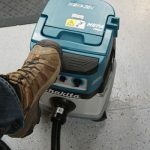 We also liked that the unit has a large, oversized on-off switch, and found it easy to operate with your foot. 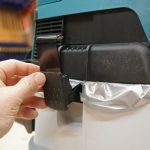 The folding top handle is super convenient for carrying this vac, and folds flat when not needed or when storing. The 1-inch anti-static hose is 11-feet long and made from durable, quality materials. It extended well and did not kink and twist easily. 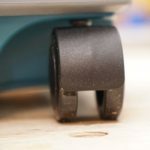 The large rubber bumper help protect interior trim or other woodwork. 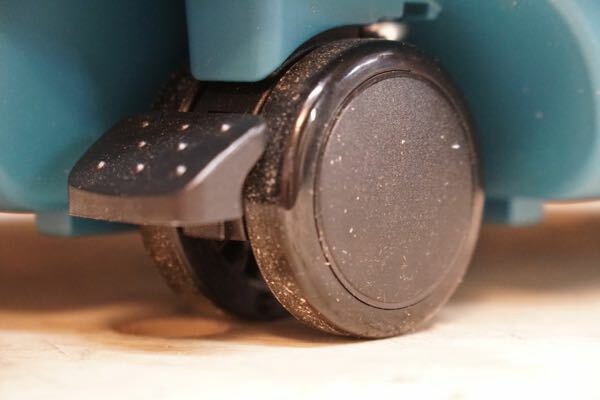 The vacuum’s small wheel casters allow the unit to be easily wheeled on hardwood, and carpet. The unit did struggle rolling on large debris. 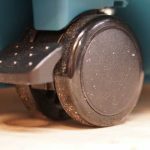 We noticed that the vacuum wheel casters look a lot like an office chair caster instead of a heavy duty wheel like this vacs bigger brother has. 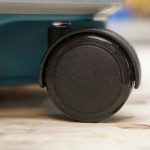 The rear casters feature locking levers to prevent the vacuum from moving and worked fine. 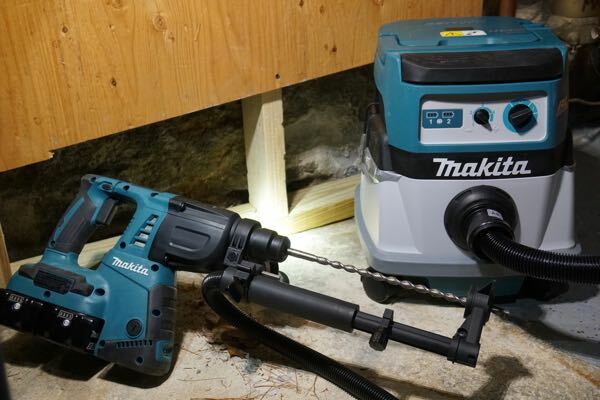 The Makita XCV07Z performed well in our testing. 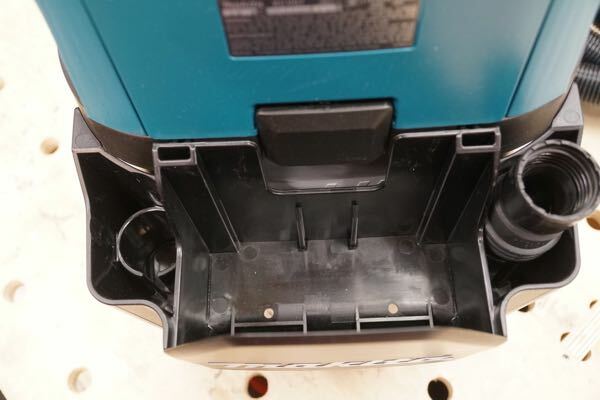 My only dig to this vacuum is reduced cfms when compared to the corded unit. 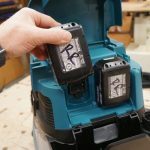 The corded vacuum achieves 127 cfms vs 74 cfms with the battery model. 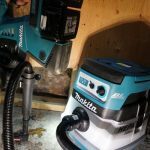 For us the compact, lightweight ability to get a cordless dust extractor operation to the jobsite was appreciated and makes following Table 1 easier. 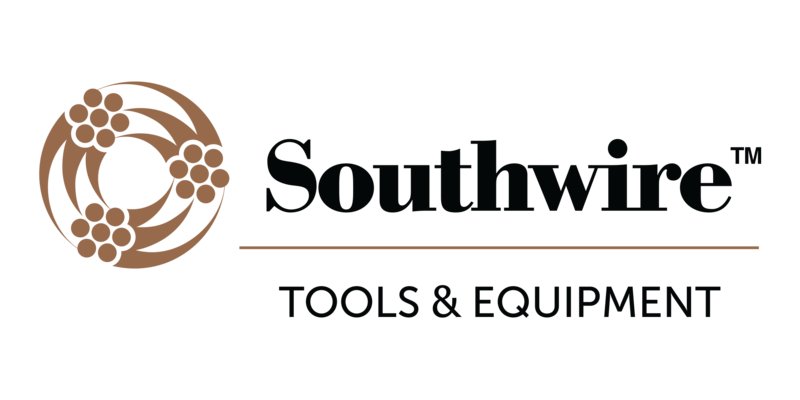 The small footprint makes it easy to carry, transport and store in our tool trailer and always be there when needed. 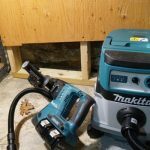 It’s also a GREAT size for small drilling applications and because its not a huge, heavy unit my guys are more likely to use it for small stuff, and NOT blow it off – that’s a win for their health. 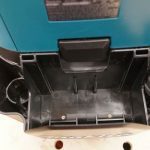 What is missing from this post is the adaptability (or not) of the tool cuffs to other manufacturers’ drills AND this drill bit size limitations of the 3 cuffs. 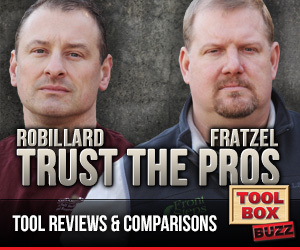 With a MSRP of $570 it had damn well fit ANY drill.